The Active Directory profile with active end-to-end encryption currently offers maximum security. Only users, organisational units and roles are imported. The permissions and the hierarchical relationship between the individual objects needs to be separately configured in Password Safe. The advantage offered by end-to-end encryption is that Active Directory is “defused” as a possible insecure gateway. 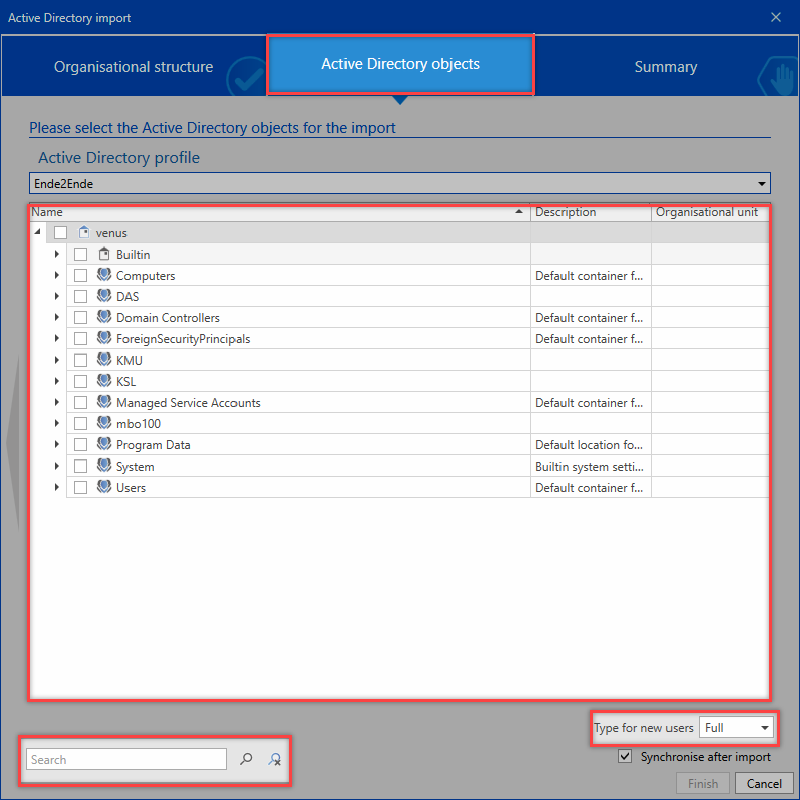 In Master Key mode, users who control Active Directory receive de facto complete access to all passwords because resetting a Windows user name enables users to log in under another person’s name. Active Directory is thus the leading system. *Using an active E2EE connection, users require their own password for Password Safe. There is thus no access to users’ data via Active Directory. 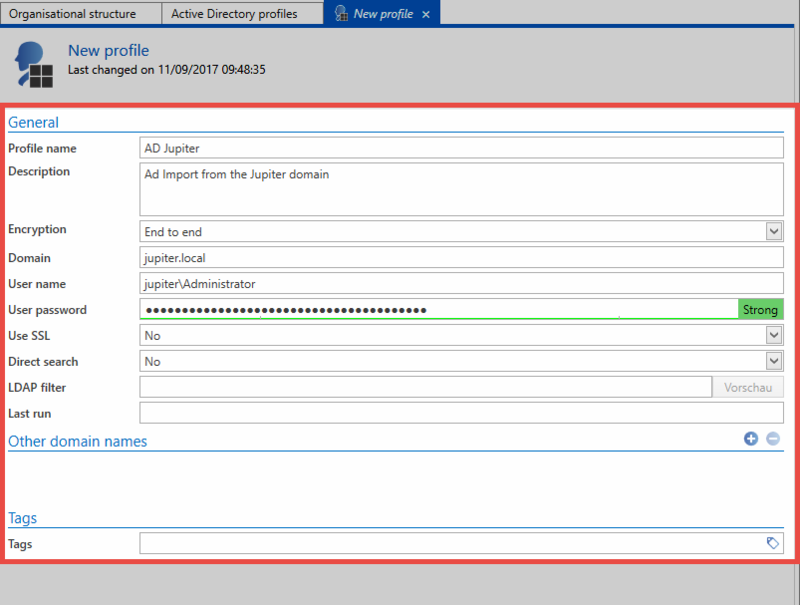 The process for creating a new profile is started via the icon “manage profiles” on the ribbon. Direct search is recommended for very large domain trees. The representation of the tree structure is omitted, elements can only be found and selected via the search. The import is started directly in the ribbon. A wizard guides the user through the entire operation. In the next step, select the relevant profile that should be used for the import. 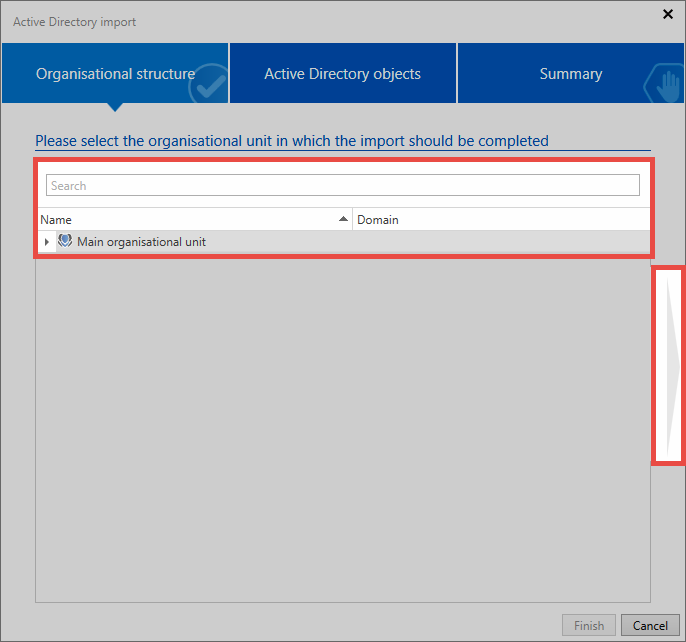 Then, select the organisational units and/or users for the import. A search is available for this purpose. It can be seen that the organisational units Jupiter and Contoso contain items to be imported. The organisational units themselves will not be imported. The check next to the group Accounting indicates that the group itself will be imported along with some of its sub-elements. A context menu that is accessed using the right mouse button is available within the list that provides helpful functions for selecting the individual elements. The last page summarises which objects will be edited and in what form. It specifies the names of the elements along with their descriptions. 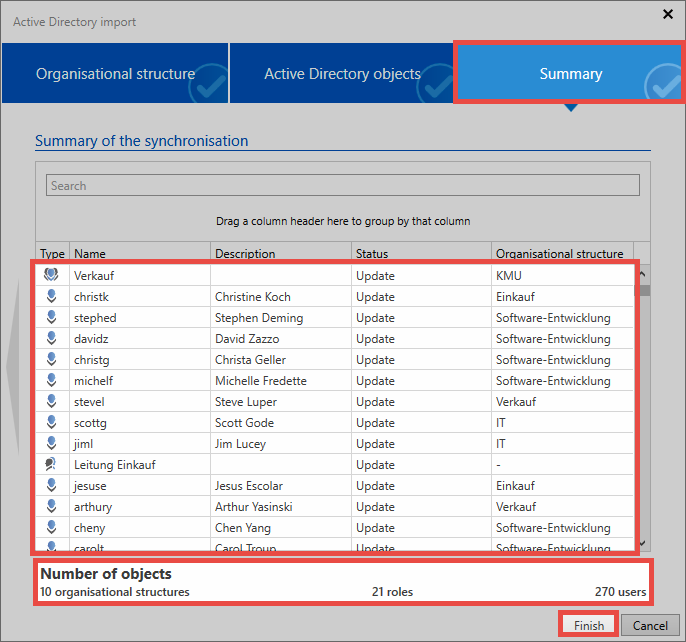 The Status column specifies whether the object is added, updated, or disabled. The last column specifies the organisational unit into which the element is imported. The number of objects is added together at the bottom. *Depending on the amount of data, it may take several minutes to create the summary. The import itself is carried out by the server in the background. The individual elements then appear in the list one by one. This may take some time, depending on the amount of import data. If the import is terminated, you will receive a confirmation. *As end-to-end encryption is retained in this mode, the server does not receive a key to match already imported users with the AD. There is thus no synchronization with the AD. Similarly, no memberships can be imported. After the import, users must be manually assigned to the appropriate organisational units and roles. In end-to-end mode, the imported users behave like local users. The users can/must be edited manually in Password Safe. The affiliations to organisational units and/or roles must be adapted manually. *In end-to-end mode, no role affiliations are issued during the import or synchronisation. Users imported in this mode can not login with the domain password. Rather, a password is generated during import. This password is sent to the users by e-mail. If a user has not entered an e-mail address, the user name is entered as the password. The initial password can be changed by the administrator or the user himself at the first login.